DNA replication occurs through a semiconservative mechanism, because each new molecule is made up of one old strand and one new strand. DNA is the genetic material and is propagated throughout generations. 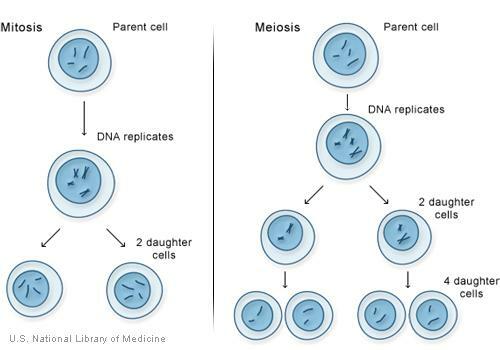 Since it has to be inherited, it must also be copied from a cell to its daughter cell. This is required during mitotic cell division or through the process of producing gametes by meiosis. This must be done with high accuracy during every cell division to prevent mistakes accumulating and being passed onto the next generation. Cells need to copy their DNA very quickly, and with very few errors. The accumulation of errors increases the risk of diseases such as cancer. To ensure accurate replication of DNA, cells use a variety of enzymes and proteins that work together to make sure DNA replication is performed smoothly and correctly. As previously described, DNA is made up of two strands that wrap around one another to form a helix. The DNA polymer is made up of nucleotide monomers that also define the sequence of the DNA that needs to be copied to the next generation of cells. The two strands of DNA are complementary to one another (i.e. the sequence of one strand can be determined from the sequence of its pair). Additionally, the strands have directionality determined by the orientation of the sugar-phosphate backbone. Importantly, the directionality of the strand pairs runs in opposite directions. DNA replication is defined as semiconservative. 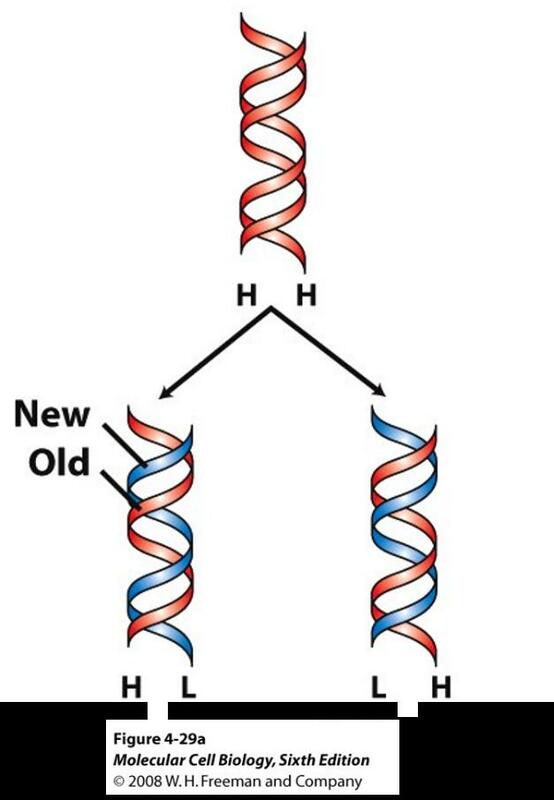 This means each strand in the DNA double helix acts as a template for the synthesis of a new, complementary strand. Semiconservative replication then starts with one DNA molecule, and produces two daughter molecules. Each daughter DNA molecule has one new strand and one old strand. To start the process of DNA replication, the two strands of the helix have to be separated, to allow the binding of the replication machinery. This occurs through the binding of the enzyme DNA helicase. DNA helicase is able to detach the strands by splitting the hydrogen bonds between the bases. DNA helicases act at specific regions of the DNA called origins of replication. The unwinding of the two strands by DNA helicase creates a replication fork, a Y-shaped structure where each prong is a single strand of DNA. Which helicase moves along the strands, creating a replication bubble. The separated strands provide a template for synthesising a new strand. Proteins called single-strand binding proteins coat the separated strands keeping them from re-forming a double helix. Next, an enzyme called primase makes a small piece of RNA called a primer, which marks the starting point for the synthesis of the new strand. Another enzyme called DNA polymerase binds primer and begins the synthesis of a new strand. DNA polymerases are responsible for synthesizing DNA incorporating complementary nucleotides one by one to the growing chain. The fact that DNA strands in a double helix run in opposite directions is a problem for the replication machinery, because DNA polymerase can only add bases in one direction, from “5’-3’” (5’-3’ is simply a way of denoting directionality of the DNA strands). To overcome this, the two strands are copied with different mechanisms. One of new strands (termed the leading strand) is made continuously. 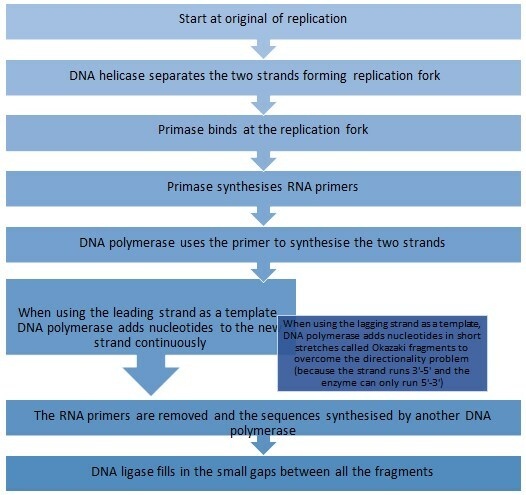 The DNA polymerase progresses down the strand behind the replication fork which unravels the DNA ahead, adding bases one by one in a 5’-3’ direction. 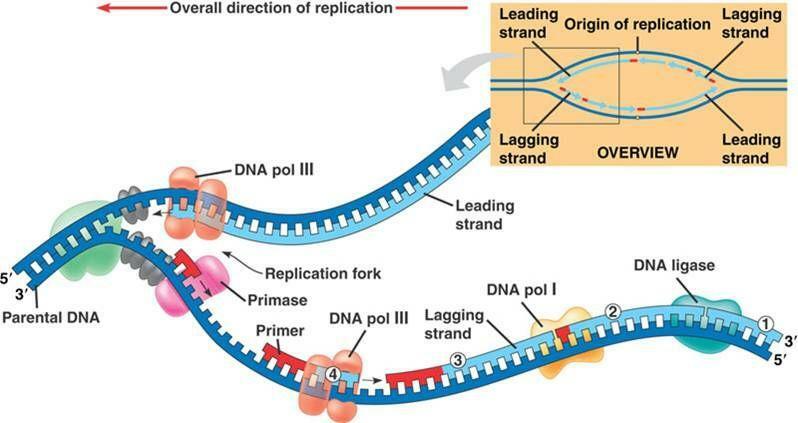 The other strand (termed the lagging strand) cannot be made in this continuous way by DNA polymerase, because it runs in the opposite direction. DNA polymerase can therefore only make sequences from 5’-3’ in small sections, because the enzyme is moving away from the fork, so needs to release from the DNA and reattach at different points. These small sections are called Okazaki fragments, which are synthesised in a discontinuous manner. The lagging strand needs a new primer for the synthesis of each Okazaki fragment. DNA polymerase can then add a short row of bases in 5’-3’ direction. The next primer is added further down the lagging strand, another fragment is made, and the process is repeated. Now, the enzyme exonuclease removes all the RNA primers from both strands of DNA. Another DNA polymerase then fills in the gaps left behind. Finally, another enzyme called DNA ligase seals up the fragments of DNA in both strands to form a continuous double strand helix.